A film featuring the founders of CovalentCareers, Inc. 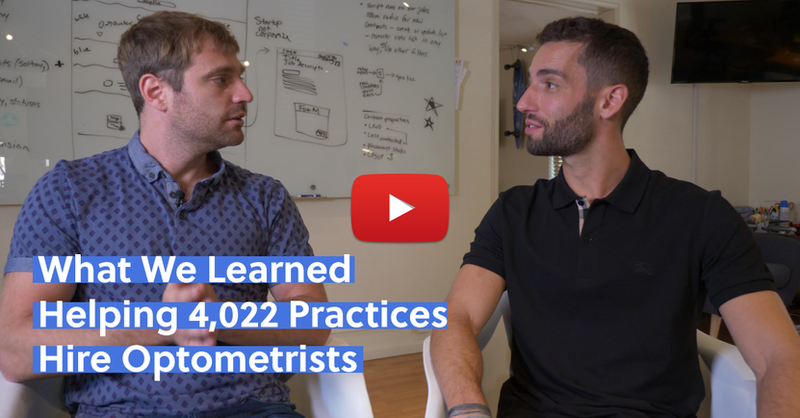 In this video we share the lessons learned from helping 4,022 practices hire optometrists (as of August 2018). We've seen it and heard it all, and now we're sharing what we've learned to help practice owners out there. Download all of the FREE hiring templates, tools, and resources we talk about by filling out the form at the bottom of this page! There are several forces impacting the supply and demand curve of optometrists. We've provided customizable optometrist job templates you can download and make your own. Our Microsoft Excel Spreadsheet calculator will show you exactly the ROI of hiring an OD and how to balance your hiring costs. The supply and demand curve has shifted, making it more challenging to find and hire optometrists. While in previous years there was an oversupply of optometrists, there is now an undersupply due to various forces impacting the profession. While this undersupply is often debated, here at CovalentCareers we hear from our clients every day how difficult it is to hire optometrists. Many practices have vacancies that have lasted 12-24 months, one indication of an undersupply of optometrists, especially in specific geographical regions of the United States. These are the forces that are making it difficult when it comes to hiring optometrists. The profession as we know it today was built off the hard work and labor of baby boomers. Baby boomers are now retiring and this trend is just getting started. This means current practice owners must replace themselves in their practices. Corporate practices are growing at an increasing rate, which means a higher volume of open exam lanes. This increase in supply puts further pressure on the short supply of optometrists, especially in rural regions of the country. Healthcare reform and the Affordable Care Act has increased the number of insured Americans by over 20 million lives. This means there are now more patients with insurance benefits who are seeking care. Private equity plays an increasing role in purchasing and expanding practices, creating more competition for practice owners when it comes to hiring. While there might seem to be an oversupply of optometrists in certain major cities, this doesn't represent the problems a majority of practices across the country are facing, particularly in rural areas. This means you must be equipped and prepared to attract the best talent to your practice. As corporate optometry expands, more ODs are choosing to work in this practice modality. There is good reason for this! Large corporate companies have the infrastructure and resources to offer optometrists competitive salaries as well as medical and retirement benefits. In recent years, corporate optometry organizations have listened to the voices of optometrists and made vast improvements in what it's like to work at these locations. The improvements listed below have helped attract and retain new talent. These 5 improvements are very important to optometrists and just a few of the reasons more ODs are entering corporate optometry as apposed to private practice models. Not only that, but corporate companies have large recruiting teams. They have highly trained professionals dedicated to talking with optometrists and filling vacant positions. This certainly puts private practices at a disadvantage when it comes to hiring optometrists — a call to action for private practices to step up their recruiting game as well. Download our 2017 Optometry Industry Survey of 1,000+ optometrists and students, for an in-depth look on what drives ODs to choose certain jobs, and what is most important to them. Important Lesson: When it comes to hiring optometrists, recruiting and searching for optometrists takes more time than you think, and the time spent on hiring can negatively impact your practice's revenue. Just as practice owners take a proactive approach to getting patients in their doors, they need to be taking a proactive approach to hiring optometrists. Simply putting an ad on a page and doing nothing else might not produce the results you had hoped for. However, a proactive approach requires focus and time, which is time they're not spending generating revenue for the practice. Anytime you make an investment, you should consider the return. Practice owners do this routinely when it comes to making decisions for their practice. The same is true when it comes to hiring optometrists. There are so many costs to consider when it comes to hiring, both direct and indirect. Most practice owners don't invest enough in their hiring process and forget how much revenue an optometrist can bring in. Our argument is to stop and watch our video above. CovalentCareers believes you should accurately understand the revenue an OD can bring to your practice prior to investing in your hiring process. Only then can you truly make an educated decision on the dollar amount to invest in your hiring process. Important Lesson: One MAJOR factor practices overlook is the cost of vacancy. While this might only seem like a major issue for practices that have NO doctor, it is important to think about the money you are leaving on the table if you can grow your practice with a doctor, but do not have one to see this growing demand of patients. We see it all the time. Many practices wait until the very last minute before starting their search for an optometrist. They think that they can list a job ad and within 15 days have a candidate hired. This is NOT the case, and certainly is NOT what we have seen helping 4,022 practices hire optometrists! Start early. Give yourself ample leeway when it comes to the hunt. Don't be afraid to leave an ad open for extended periods of time. Even if you are not hiring right now, by leaving an ad open and live, you consistently receive a stream of potential employees who might be a fit for your practice. It is okay to be transparent in your ad and let candidates know that this is for a potential future need. Just because you have an ad open does not mean you are forced to make a hire if someone responds to it! Don't rush. Hiring the wrong optometrist can cost you not only money, but time. Use all the resources available. Posting a job on one place is not enough to capture everyone's attention. For this reason, the job platform at CovalentCareers puts your optometrist listing everywhere. Market your position. Just like you would market to bring in patients, you want to market your practice to potential optometrists who know nothing about you! Having a strong listing that highlights you and your practice is critical. Recruiters often get a bad reputation . . .
We get asked all the time: do I need the help of a recruiter? How does it all even work? Marketing is extremely important when it comes to getting your position out there, but naturally, some practices do not have the time or resources to market a job opening on their own. This is when using the help of a recruiter is beneficial. Take an active role in sourcing candidates. Recruiters typically will make 150 phone calls every day to find you potential candidates. Market your job using online tools that practices don't have access to. Screen candidates for you based upon set parameters you provide. Help you through the interview process. Assist you in the offer process and deal with any competing offers. In addition to marketing your job in every way possible, we also offer recruiting services at CovalentCareers, and it has been extremely effective for helping practices find the best candidates. Candidates are interested in working in practices that have a culture and a mission that speaks to them. The current generation of optometrists want to be part of something bigger than themselves. However, money is very important, especially to new graduates who are graduating with more student loan debt than ever before. We've frequently seen job seekers accept the highest bidder. This shouldn't sound like a major surprise. As the supply of optometrists has decreased and the demand for optometrists has increased, the pressure put on practice owners to offer higher salaries is something we see on a routine basis. If you cannot offer a higher salary than a competing entity, then you need to offer some other sort of value. We have discovered many optometrists value working in a medically based practice. Use this to your advantage when it comes to presenting your practice in your job offer. Another potential aspect you can leverage is offering a candidate the ability to grow in your practice — such as the potential for future partnership. Candidates value different things. A simple strategy you can utilize is speaking to your candidate and understanding what they value, and then offering them something that meets that value, even if it is at the expense of a higher salary. Download the customizable job description templates AND cost to hire calculator discussed in the video above to determine costs to hire and attract the best talent!